1. I could walk a marathon. Lily stops every 2 seconds. 2. We both ring a bell when we need to pee pee outside. 3. My favorite toy is a pink ugg. 4. I am very brave. Lily thinks everything is a monster and screams. 5. I scratch my right ear every night at 9PM before I fall asleep. Lily snoozes no matter what. 1. Noodles cause we want to squeeze that face. And Lincoln is scared of everything just like Lily is. Silly dogs. CONGRATULATIONS on this award. I think you chose some grrrrrrreat ones to give it to. AND your reasons are super!!!! Congrats. You are both pawsome. Oh, boy! Congratulations on your award and thanks you so much for giving its to us!!!! We're so honored. Congratulations on the award! Thanks fur the image of you scratching your ear before you sleep, that's gonna be stuck in my head fur ages, BOL. Congratulations!! You are so deserving of the award!! Congratulations on the award, furry thanks for passing the award on to us! you ring a bell when you have to pee? Will you please teach Dakota how to do that? Aw SHUCKS!!! Thanks for the award. I want to see you ring the bell, that's super cute!! And I like how you scratch your ear every night at 9 pm. That's great. Congrats you two, you deserve ALL the awards! Aw, thanks! Benny... you're totally right! You and I could rule the ladies world if given the chance! Thanks, pals! Not sure that we are such awesome bloggers lately, mom keeps having to work! Hope to get back to posting before too long! 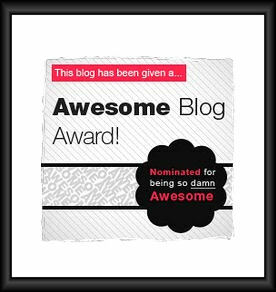 Congrats on that wonderful award - and not only is your blog awesome but you two are as well. Congrats on your award! You two work so hard at entertaining all of us so you sure did deserve the recognition! That's very interesting stuff about you guys. CONGRATS on the award!! Very interesting facts about you both!! Congrats on your well deserved award! I love learning more about my friends. You are a hoot! Scratch your right ear, why? I loved reading those facts about you two! And the scratching my ear at 9pm... pawesome! Thanks a lot for giving it to me! CONGWATOOLATIONS on being given such a pawsome awawd!!! You twooly desewve it! I loved heawing all those factses about you two..exackly at nine??? wow do you set an alawm ow do you check youw watch? You deserve it, you are beyond awesome!!! Congratulations on your award! We wish we had a bell to ring to go outside. We'd never stop ringing it! What a great award! Congratulations. Mommy said she wishes I would ring a bell when I need to go poddy. Could you come teach me? Love the facts about you guys. Wow what a great award!!! Go you guys! You DO have an awesome blog!! Congrats! Congratulations on your award! Brillo paws to learn more about you.